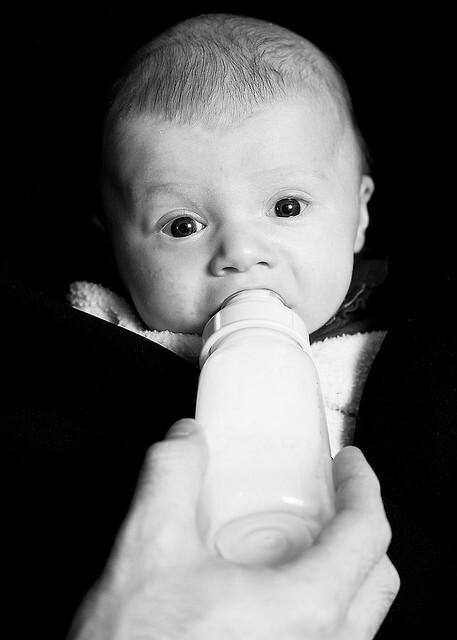 Formulas marketed to reduce spit up and/or reflux usually have an extra thickener added. This simply makes the formula harder for baby to get all the way back up the esophagus. The most common thickener used is rice starch. Enfamil®’s A.R. formula does not stand for “acid reflux” (although the company may like you to think it does!). It actually stands for “added rice”. The research showing that this thickening technique reduces reflux is very lacking. The downside to choosing such a formula is that a fair proportion of the carbohydrate source of this formula will now come from rice starch, as opposed to lactose. This must be weighed against the potential benefit of reduced spit up. Another tactic that may be used to prevent spit-up is to use 100% whey protein. This is because (as discussed in article 4), whey protein empties little stomachs faster than casein protein. The faster formula is moved out of the stomach, the less likely it is to come back up. I have no problem with 100% whey protein formulas and if they help reduce your baby’s spit up volume, all the better! There are positioning techniques for holding baby during and after feeding that are more likely to help with spit-up and reflux than switching to one of these specialty formulas. Several formulas claim to prevent fussiness, gas, and colic. Many formulas that contain partially or extensively hydrolyzed protein make the claim that they can help reduce all manner of fussiness. The thinking is that more digestible proteins will reduce general infant indigestion and gas which will improve disposition. That is also why some companies refer to hydrolysate as “comfort” proteins. Similar claims are made regarding probiotics using the same line or reasoning – improving ease of digestion will decrease discomfort. While the logic makes perfect sense, these claims are a stretch from a scientific standpoint. While these may help a few infants, there are a million reasons why your baby may be fussy at any given time, and there is no good research to support that hydrolysate protein or probiotics will diminish gas or fussiness. If we truly knew how to cure fussiness and colic, there would be a lot fewer sleep-deprived Mamas and Papas out there! Don’t get me wrong – I actually approve of probiotics and hydrolysate proteins in infant formula, I simply do not want parents to have false hopes about what these ingredients will do. Formulas that contain partially or extensively hydrolyzed protein often claim that their formula will help prevent atopic disease on your little one’s skin. This claim is actually legitimate! How refreshing! There is good research out there to support the benefits of hydrolyzed formula (7-9) and I highly recommend choosing one. All babies spit up, have gas, cry, and are occasionally fussy. It’s possible a specialty formula may help. However it most likely won’t serve as a magic cure-all. It is much better to know what type of specialty ingredients may be beneficial for your individual baby and then chose a formula accordingly. There actually is great research to support hydrolysate proteins for infants at-risk for atopic disease and food allergy.